Heat oven to 350°F. Spray 2 1/2-quart casserole dish with cooking spray. In 12-inch nonstick skillet, cook bacon over medium heat 5 minutes or until crisp, stirring occasionally. Remove bacon to paper towels to drain. Add onion, jalapeno and garlic to drippings in skillet. Cook 4 to 5 minutes or until onion is tender, stirring frequently. Stir in chili sauce, brown sugar, molasses and mustard. Bring to a boil. Stir in beans, bacon and hot sauce. Spoon mixture into casserole dish. Bake 25 to 30 minutes or until hot and bubbly, stirring once. 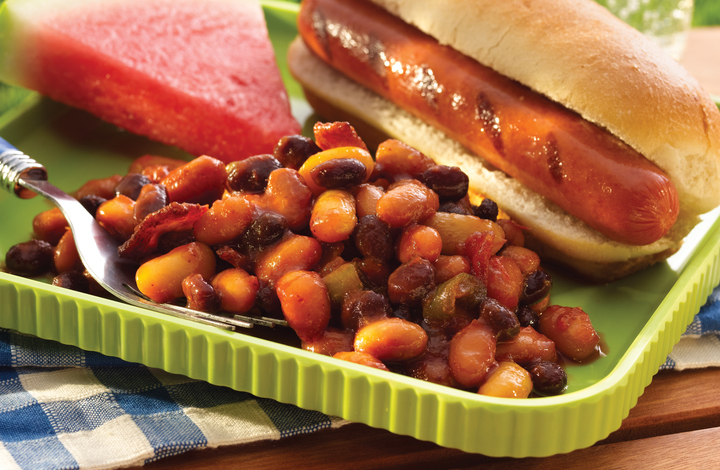 Tip: You can adapt these sweet yet spicy beans to suit your family. They have a very moderate heat level. You can increase the heat by adding more jalapeno chile and/or hot sauce.